The Parker Solar Probe has started an 8-year long study of the Sun. Here is what we will learn. 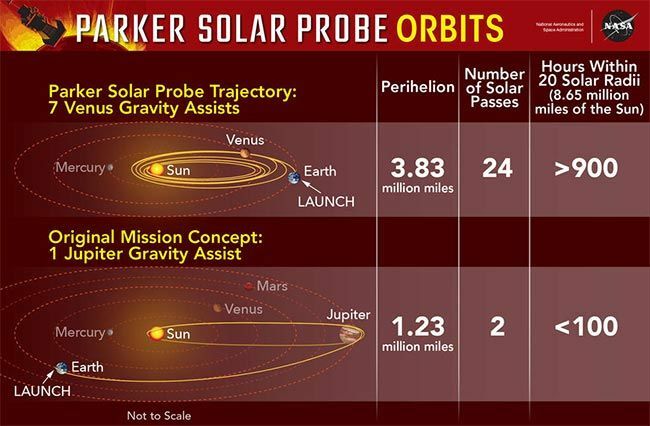 Over the course of its 8-year long mission, the Parker Solar Probewill get closer and closer to the Sun. There are seven Venus flybys scheduled, each of which will shrink the orbit of the Spacecraft. The speed of the spacecraft is also expected to increase. If everything goes as planned, at its final close approach on 12 December 2025, the probe will be just 6.9 million kilometres from the Sun and will be flying at 192 kilometres per second. That is fast enough to go from New Delhi to Agra in one second. At that point, the Parker Solar Probe will set its final record for being the fastest spacecraft, as well as the closest a man-made object has got to the Sun. The question is, what do scientists intend to learn from the mission? The primary goal is to understand the space weather better. Streaming out of the Sun is a steady stream of high energy particles, known as the “Solar Wind”. The probe carries four instrument suites on board, to study the Solar Wind and the Solar corona in unprecedented detail. The Solar Wind Electrons Alphas and Protons (SWEAP) instrument is the part of the probe that will actually “touch” the Sun. A special instrument, called the Solar Probe Cup will look at the Sun directly, and capture high energy plasma particles to study. The cup is designed to capture charged particles in the vacuum of space. This instrument looks around the protective carbon composite shield, that protects most of the instruments on board from the furious energies pouring out of the Sun. The Integrated Science Investigation of the Sun (IS☉IS) instrument, pronounced “eesis” has the symbol for the Sun incorporated into its acronym. The instrument has a series of solid-state detectors, and record the energy levels and the movements of charged particles. These particles can be electrons, protons or ions. Researchers hope to use the instrument to study the particles that are accelerated in the Solar corona, as well as the particles that are accelerated in interplanetary space. By the time these high energy particles reach the Earth, they cannot really be differentiated. The instrument will study the life spans of the particles, and track their movement from the Sun and outwards into the Solar System. Wide-Field Imager for Solar Probe Plus (WISPR) is essentially a really fancy camera. It is the only imaging instrument on board the spacecraft. The data gathered by WISPR will allow researchers to create 3D reconstructions of the shape of the Solar corona, which will help understand the context of the observations of the other instruments. WISPR will be able to study coronal mass ejections, or events more commonly known as Solar flares. Finally, there is the Fields Experiment (FIELDS) experiment. The instrument has antennas extending beyond the protective shield. Three magnetometers and five voltage sensors, combined with an electronics package make up the instrument. FIELDS will take measurements of the electric and magnetic fields, measure the electron density, and capture information about the temperature. The instrument is designed to measure the chaotic movements within the inner heliosphere, and track realigning magnetic fields on the Sun. FIELDS may even discover previously unknown phenomenon within the heliosphere, as it is an unexplored region of space. As humans deploy an increasing number of satellites and astronomical instruments in space, it is necessary to understand and predict this solar wind. The solar wind is a threat to our technologies, and we stand to benefit by understanding it better. The Parker Solar Probe will be able to observe the particles accelerate from subsonic to supersonic speeds. The experiments will be conducted in one of the most extreme and hazardous regions in the Solar System. In short, the spacecraft will study the corona, and give scientists a better understanding of the source of Solar wind.